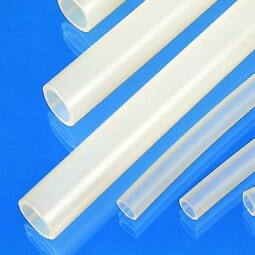 Highly resistant chemical tubing for extreme mechanical and thermal loads. Possible fields of application: chemical analytics, environmental and hygiene technology, biotechnology, semiconductor technology. In these areas the tubing is used as chemical tubing for super-clean analytics, highly loadable industrial tubing in pilot plants of process engineering and biotechnology, highly resistant chemical tubing for super-clean acids in semiconductor technology. Chemical resistance: MFA (modified fluoroalkoxy) is a newly developed fluorinated plastic. It has a very good resistance to most aggressive media, such as inorganic alkalis, oxidizing acids, mineral acids, metal salt solutions, but also organic media including hydrocarbons, anhydrides, ester, ether, ketones, aromatics, amines, peroxides. At high temperatures MFA has only a limited resistance to alkali metals. Also certain organic fluorine halogen and phosphorus compounds are not suitable for high temperature application with MFA. Extremely smooth inside and outside surface, therefore minimal deposits of foreign matters. Higher transparency than PTFE, FEP or PFA. The high transparency covers the wavelength range from 390 to 770 nm (visual range) and 200 to 280 nm (UV-range). Extremely low moisture absorption: water <0.03 %. Non-oxidizing material, i.e. it burns while flame feeding, but stops burning immediately after removing the flame source. Lowest diffusion values amongst all fluorinated plastics, i.e. nearly gas-tight. Outstanding thermal stability: thermogravimetric analysis (50 min. in air at +380 °C: weight loss <0.3%). Very good mechanical stability from lowest temperatures up to +250 °C. Lowest embrittlement phenomena at temperature load. High stress crack resistance up to +240 °C. Temperature aging: very good preservation of mechanical properties after 14 days at +240 °C. Remarkably resistant also at long weathering. Very high surface resistance and volume resistivity. Volume resistivity, dielectric constant and loss factor independent of temperature.